I am searching for a camel. I know that sounds a bit strange, but let me explain. Camels once roamed the Southwest, having been released into the wild by their previous owners, often the U.S. Army, or simply having escaped from a poorly constructed corral. Small bands of the beasts wandered from northern Mexico and the Baja to Flagstaff and the Grand Canyon. That was, until the early twentieth century, when the last camel disappeared. I am looking for that camel. A little background first. Following the Mexican-American War in 1848, the United States found itself in control of a vast new territory, what we today call the American Southwest. The discovery of gold in the California Sierra along with the on-going sectional conflict over slavery placed the Southwest at the center of the increasingly vicious debate over the nation’s future. Espousing America’s Manifest Destiny to expand and conquer the continent, numerous men sought to tie the West to the East by developing a reliable transportation route. Among those people was Secretary of War Jefferson Davis, who would become the president of the Confederacy a decade later. A strong proponent of slavery and Manifest Destiny, as Secretary of War Davis advocated the opening of a southwestern transcontinental route from Texas into the gold fields of California. To do so, he came to support the idea of bringing camels from Northern Africa. He sent a military unit to the Mediterranean, where they purchased thirty-tree camels before sailing back to Texas. The camels were then moved to Camp Verde, in the Arizona Territory, where they were boarded until 1861. In 1861, President Lincoln commissioned Edward Fitzgerald Beale to survey a viable route through the Southwest. Beale’s expedition included many of the camels brought from northern Africa and Turkey, and opened up the route from Texas to Los Angeles, the same one that Route 66 would later follow. The Civil War and the completion of the Transcontinental Railroad in 1869 brought an end to the use of the military’s use camels. Many of the military’s stock were sold off to carnivals, released, or were simply shot as many of those who dealt with the animals despised the beast’s surly disposition and, well, unique odor. This is where my search comes in. Where did these animals go? And what were their impacts before fading away into history? Throughout the late nineteenth century, travelers spoke of seeing camels throughout the Sonoran and Mojave Deserts—the most infamous being the Red Ghost. The tale of the Red Ghost typically begins one morning in 1883 on an isolated ranch near the southeastern edge of the Arizona Territory. One morning, the two men rode out check on their scattered livestock, leaving behind their wives, two sisters, and few children. The women managed the daily life of the ranch, including collecting water from the nearby spring. Sitting astride a red beast, taller than horse, sat a mummified man. The beast, enraged at the barking of the ranch’s dogs tore through the corral, racing towards the spring. In fear for her life, the woman slammed the door to blood curdling screams of her sister outside. Upon their return, the men found the body of the second sister trampled to death and the first sister still hidden in the house screaming about the beast. Several days later, two prospectors awoke to a rider astride an enormous red “horse” tearing through their camp. Sightings of the Red Ghost continued for years. A small band of hunters who attempted to shoot the apparition, but missed, found the head of a long dead man that had bounced off the animal as it fled. Later, a lone cowboy happened upon the Ghost. And, being a cattleman, he roped the camel. But rather than pulling on the lariat to get away and tightening the rope, the Ghost charged the started roper, who proceeded to fall off his horse and drop the lariat as the camel, still with a saddle astride its back, tore past him off into the brush. The Red Ghost’s reign of terror came to an end a number of years later, when a rancher awoke to the find the camel grazing in his garden, and shot the beast. The lariat had dug deep into the animal’s flesh, and while no body remained strapped to the camel, the saddle was still there. But story of the Last Camel did not end with the Red Ghost’s death. In 1913, the crew of a Santa Fe Railroad train swore they had seen a camel near Wickenburg, Arizona. David Hulton, of Ajo, Arizona, swore he saw a small herd of camels near a watering hole in Cabeza National Wildlife Refuge in 1924. Five years later, a traveler reported sight a solitary camel near Banning, California, and tales of camel sightings near the Salton Sea continued through 1941. Another of the expedition’s camels, its skeleton anyway, ended up in the Smithsonian. 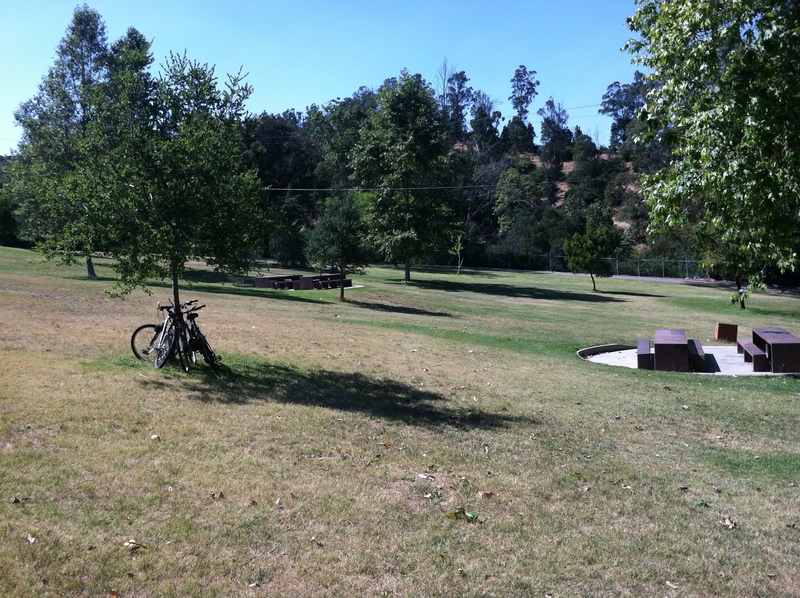 Site of the old LA Zoo, now a part of Griffith Park, where Topsy the Camel spent her final days. But it turns out that the last camel resided, of all places, the Los Angeles Zoo. One of the zoo’s camels, known as Topsy, is believed to be the last survivor of a herd of camels that made the trek across the Southwest in 1861. Topsy lived a long life and died in 1934. Was Topsy really the last camel? I am not convinced. However, I do not have proof otherwise. Part of me likes to think that a lone camel still roams the deserts of the Southwest. Perhaps I am just being romantic, yet my search continues. I live in Banning, Ca and about 4 months ago, I saw a camel, a giraffe and a zebra grazing in a field behind Sun Lakes Country Club. I turned my car around and went back to the area because I couldn’t believe my eyes. I stopped and watched the animals for about a half and hour until a man in a pick-up truck stopped and asked me if I needed help. I have been back there several times and have seen the zebra and giraffe again, but not the camel. I have never heard of these camels before. I consider myself fairly well read, and am disgruntled to find I have no knowledge of the camels. Now I’d like to find them. Can they all be dead? Surely they produced offspring.